Notes: The fortress of New Navarino (Greek: Νέο Ναυαρίνο; Ottoman Turkish: Anavarin-i cedid) is an Ottoman fortification near Pylos, Greece. It is one of two castles guarding the strategic bay on which it sits; New Navarino is located in the southern entrance of the bay, while the northern entrance is guarded by the 13th-century Old Navarino castle, built by the Crusaders of the Principality of Achaea. In juxtaposition with the latter, New Navarino is often known simply as Neokastro or Niokastro (Greek: Νεόκαστρο or Νιόκαστρο, "new castle"). The fortress was built by the Kapudan Pasha Uluç Ali Reis in 1572/3, shortly after the Battle of Lepanto. In 1645, Navarino was used as a base for the invasion of Crete during the opening stages of the Cretan War. During the Morean War, the Republic of Venice under Francesco Morosini captured both fortresses of Navarino in 1685/6, defended by Mustafa Pasha and Djafer Pasha respectively. Along with the rest of the Peloponnese, the fortresses remained in Venetian hands until 1715, when the Ottomans recaptured them. The fortress was captured by the Russians on 10 April 1770, during the Russo-Turkish War of 1768–74 and the Russian-inspired Orlov Revolt in Greece, after a six-day siege, and the Ottoman garrison was allowed to evacuate to Crete. The Russian control was brief: already on 1 June 1770, the Russian fleet abandoned Navarino, which they destroyed in part, to the Ottomans. After the outbreak of the Greek War of Independence in March 1821, the Greeks besieged the fortress for several months. The garrison surrendered in the first week of August 1821 after being assured of safe passage, but were all massacred. The fortress remained in Greek hands until captured by Ibrahim Pasha of Egypt on 11 May 1825. 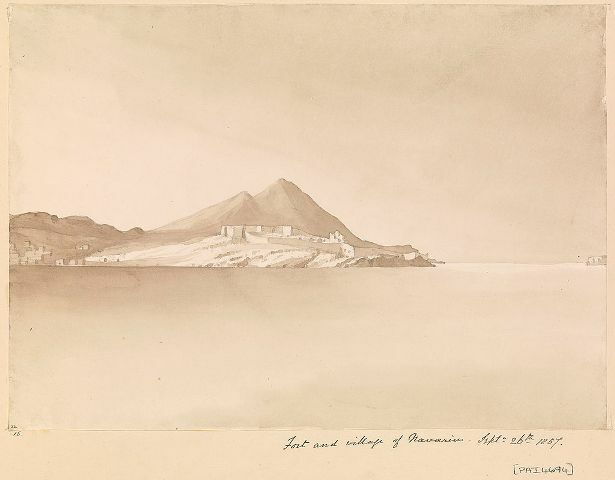 The Ottoman-Egyptian garrison remained in the fortress until it was handed over to the French troops under General Nicolas Joseph Maison in spring 1828.